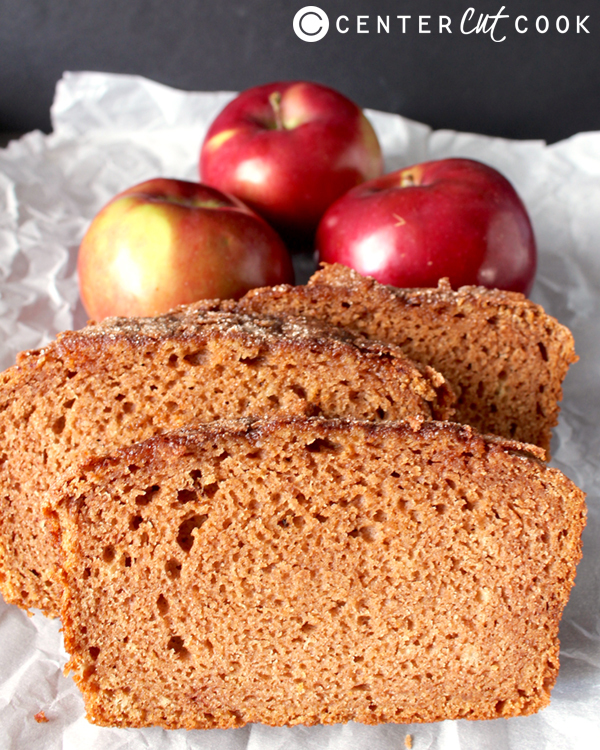 This Cinnamon Apple Bread is made with applesauce which keeps it super moist, has the best crackly cinnamon sugar topping, and is so easy to make. This quick bread is so delicious! 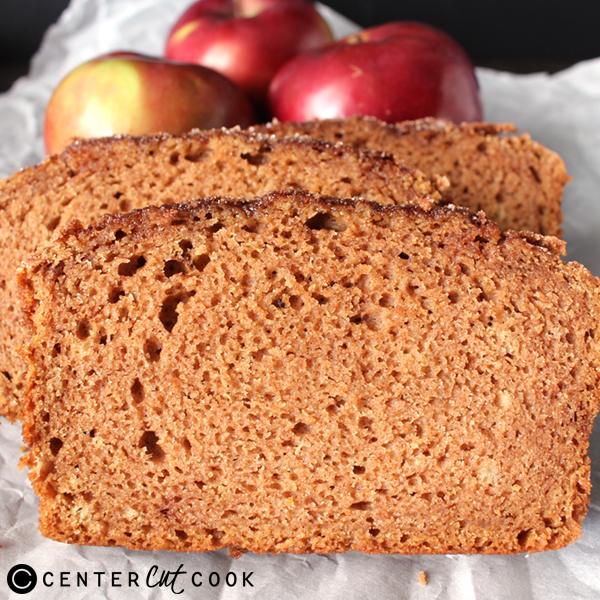 This cinnamon apple bread is one of my favorite treats ever!! The first time I had it I couldn’t quit eating it. I kept taking small slices until eventually half the loaf was gone!! It is perfectly moist, sweet, and has just the right spices. The cinnamon sugar topping adds nice texture and makes it even more irresistible. That part reminds me of cinnamon toast- a favorite snack of mine growing up. 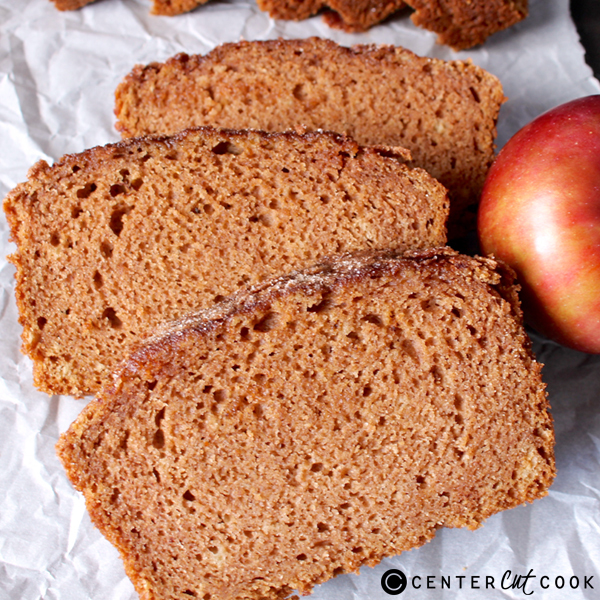 So this is like a cross between apple bread and cinnamon toast- that is one delicious combination! It is made in one bowl (besides the topping), is in the oven in 5 minutes, and is filling your home with a sweet aroma soon after. I just love how simple it is and I’ve made it so many times. It just gets better on the second and third day, so it’s great to make ahead of time. You will love everything about this bread! From how quick to comes together, to the smell it makes while it’s baking, to the praise you get from everyone who eats it. This is the perfect fall treat. Preheat the oven to 350° and grease a 9×5 loaf pan. Make the topping first: in a small bowl, mix sugar and cinnamon. Set aside. In a large bowl, combine butter, sugar, apple sauce, apple cider, and eggs. Stir until smooth. Add flour, salt, baking soda, baking powder, cinnamon, and apple pie spice. Stir until all the dry ingredients are incorporated and there are no dry pockets left. Pour into prepared pan sprinkle with cinnamon sugar mixture.